I see this happen to almost everyone as soon as they stop building muscle - they start to panic. First they move from low-reps to high-reps, then from high-volume to low-volume. Finally they start trying 'alternative styles' of working out because 'nothing was working'. The truth is, EVERYTHING works - the key is to find the best workout for you depending on where you are in the anabolic continuum. Forget body-part splits and forget whole-body workouts. Both of these techniques work great for beginners, but after a while we both know they stop working. Then what do you do? Lift heavier? Lift more? Lift less? It all gets so desperately confusing. Sometimes gaining strength works wonders, other times you need to concentrate on volume. Sometimes you need very little rest, other times you need LOTS of rest. What works best depends on your degree of anabolic sensitivity - What worked when you were growing may not necessarily work now! Here's the truth - successful muscle building is nothing more than the right combination of stress and inflammation balanced with rest and recuperation. Get these in balance and add in the RIGHT diet and YOU WILL BUILD MUSCLE. 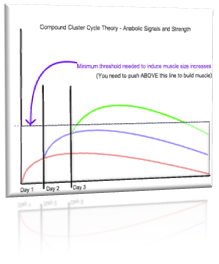 Over the past decade, I’ve used a system called Compound Cluster Cycles to help whenever I get stuck in a rut. Now, Compound Cluster Cycles are HARD (I only do them twice in any given year) but they are EFFECTIVE. This is a revolutionary way of combining your workouts that will stress your muscles to their limits AND give them an amazing ability to recover! That's right: More stress AND more recovery. The Anabolic Again Muscle Building Protocol is my personal breakthrough – my way to force my body to build more muscle, even after I thought more muscle was completely impossible.